At bdb our mantra is that real wealth is measured in time, relationships and experiences which is why we have partnered with Travel Producer to bring you monthly travel inspiration. This month we lift the stone of travel experience and uncover the unique Galapagos Islands. In today’s headline grabbing world, unique is an overused adjective but, in the case of this archipelago, they are truly unique in the proper sense of the word. Lying some 1,000Km off the coast of Ecuador, the islands boasts wildlife and landscapes found nowhere else on earth. They will inspire the intrepid traveller to think differently about the world as, indeed, they inspired Charles Darwin to formulate his theory of evolution by means of natural selection. The wildlife that calls these islands home, many found nowhere else on earth, act as if we humans are little more than a slightly annoying interlude in their everyday life. There being precious few natural predators, the creatures have no fear of man which means you can get up close and personal with all the wildlife – a feature that children absolutely love and one that adults probably won’t experience anywhere else. The ability to walk amongst courting birds who don’t consider breaking off their mating dance or to sit down next to a basking seal or an iguana taking a break from feeding, or even to swim alongside penguins and turtles, is an experience to be treasured. Formed from volcanoes 20 million years ago, the uniqueness of the Galapagos stems from its isolation and its fragile ecosystem. It’s obviously a go-to destination for scientists of all persuasions but you don’t need to be an evolutionary biologist, geologist or ornithologist to enjoy the wonders of one of the few places left on planet earth where the human footprint is strictly controlled and kept to a minimum. To us ordinary humans, it is the wildlife that are the stars of the show. 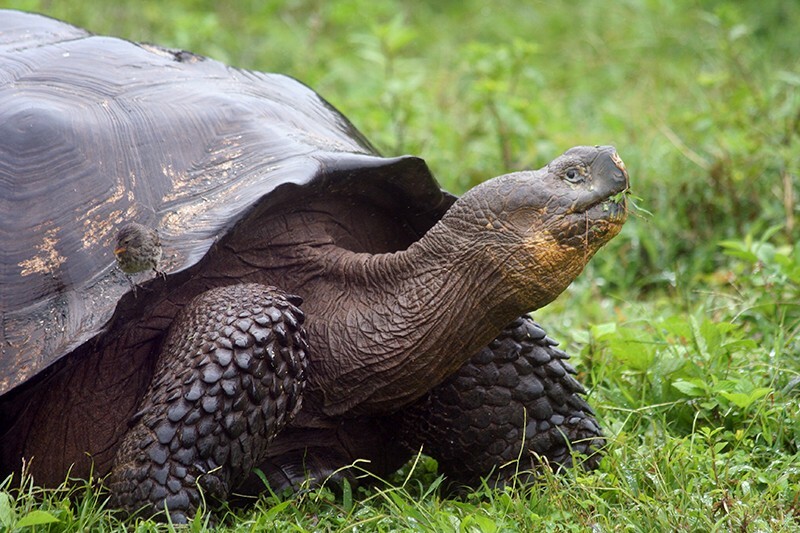 Galapagos stems from a translation of the word tortoise and a close encounter with a giant tortoise is an unforgettable experience. These slow moving, water gulping vegetarians are the gentle giants of the archipelago and can be found on many islands. Marine iguanas are impossible to miss as large numbers of them litter the shoreline like heaps of poorly stacked bricks. Stunning birds such as the red breasted Frigate or the blue footed Booby (my personal favourite) entertain with their mating routines whilst Pelicans dive bomb the seas for fish. Under water, armed with a mask and snorkel, you can swim alongside penguins or be closely examined by inquisitive seals. For the more adventurous, scuba diving will reveal all types of Ray, several species of Shark and thousands of varieties of marine life in some of the top rated dive sites in the world. The Galapagos being islands, the only way to experience all these animals is by boat, be it sailing boat or cruise ships of varying size and luxury, plying the waters of Darwin’s playground. Most trips will visit selected islands depending upon the time of the year and the weather and you will spend each day exploring a different part of this amazing area. Qualified, English speaking naturalists travel with you on all good quality cruises. A cruise trip can last anything between 5 and 16 nights in length and are available year round. it’s well-nigh impossible to exaggerate the sheer spectacle of the area. The beauty of the Galapagos cannot be explained only experienced! Discover our curated Luxury Galapagos Islands and Galapagos Islands with kids itineraries.